Kidney cancer is a cancer that starts in the kidneys. Cancer starts when cells in the body begin to grow out of control. Cells in nearly any part of the body can become cancer, and can spread to other areas. To understand more about kidney cancer, it helps to know about the kidneys and what they do. Small glands called adrenal glands sit above each of the kidneys. Each kidney and adrenal gland is surrounded by fat and a thin, fibrous layer known as Gerota’s fascia. The kidneys’ main job is to filter the blood coming in from the renal arteries to remove excess water, salt, and waste products. These substances become urine. 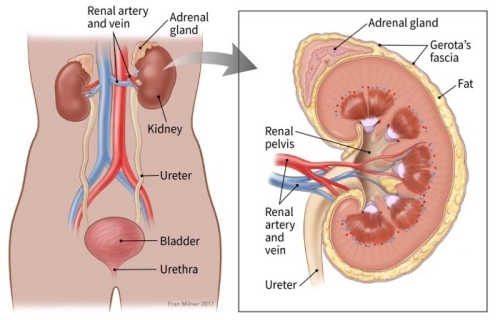 Urine leaves the kidneys through long slender tubes called ureters which connect to each kidney at an area called the renal pelvis. Urine travels down the ureters to the bladder, where it is stored until you urinate (pee). They help control blood pressure by making a hormone called renin. They help make sure the body has enough red blood cells by making a hormone called erythropoietin. This hormone tells the bone marrow to make more red blood cells. Our kidneys are important, but we can function with only one kidney. Many people in the United States are living normal, healthy lives with just one kidney. 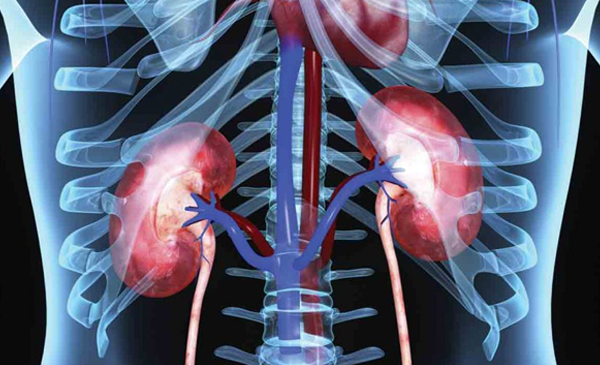 Some people do not have any working kidneys at all, and survive with the help of a medical procedure called dialysis. The most common form of dialysis uses a specially designed machine that filters blood much like a real kidney would. Renal cell carcinoma (RCC), also known as renal cell cancer or renal cell adenocarcinoma, is by far the most common type of kidney cancer. About 9 out of 10 kidney cancers are renal cell carcinomas. Clear cell renal cell carcinoma: this is the most common form of renal cell carcinoma. About 7 out of 10 people with RCC have this kind of cancer. When seen under a microscope, the cells that make up clear cell RCC look very pale or clear. Chromophobe renal cell carcinoma: this subtype accounts for about 5% (5 cases in 100) of RCCs. The cells of these cancers are also pale, like the clear cells, but are much larger and have certain other features that can be recognized when looked at with a microscope . Other types of kidney cancers include transitional cell carcinomas, Wilms tumors, and renal sarcomas. Transitional cell carcinoma: of every 100 cancers in the kidney, about 5 to 10 are transitional cell carcinomas (TCCs), also known as urothelial carcinomas. Transitional cell carcinomas don’t start in the kidney itself, but in the lining of the renal pelvis (where the ureters meet the kidneys). This lining is made up of cells called transitional cells that look like the cells that line the ureters and bladder. Cancers that develop from these cells look like other urothelial carcinomas, such as bladder cancer, under the microscope. Like bladder cancer, these cancers are often linked to cigarette smoking and being exposed to certain cancer-causing chemicals in the workplace. People with TCC often have the same signs and symptoms as people with renal cell cancer − blood in the urine and, sometimes, back pain. Wilms tumor (nephroblastoma): Wilms tumors almost always occur in children. This type of cancer is very rare among adults. Renal sarcoma: renal sarcomas are a rare type of kidney cancer that begin in the blood vessels or connective tissue of the kidney. They make up less than 1% of all kidney cancers. Some kidney tumors are benign (non-cancerous). This means they do not metastasize (spread) to other parts of the body, although they can still grow and cause problems. Benign kidney tumors can be treated by removing or destroying them, using many of the same treatments that are also used for kidney cancers, such as surgery, radiofrequency ablation, and arterial embolization. The choice of treatment depends on many factors, such as the size of the tumor and if it is causing any symptoms, the number of tumors, whether tumors are in both kidneys, and the person’s general health. Renal adenoma: renal adenomas are the most common benign kidney tumors. They are small, slow-growing tumors that are often found on imaging tests (such as CT scans) when the doctor is looking for something else. Seen with a microscope, they look a lot like low-grade (slow growing) renal cell carcinomas. In rare cases, tumors first thought to be renal adenomas turn out to be small renal cell carcinomas. Because they are hard to tell apart, suspected adenomas are often treated like renal cell cancers. Oncocytoma: oncocytomas are benign kidney tumors that can sometimes grow quite large. As with renal adenomas, it can sometimes be hard to tell them apart from kidney cancers. Oncocytomas do not normally spread to other organs, so surgery often cures them. Angiomyolipoma: angiomyolipomas are rare. They often develop in people with tuberous sclerosis, a genetic condition that also affects the heart, eyes, brain, lungs, and skin. These tumors are made up of different types of connective tissues (blood vessels, smooth muscles, and fat). If they aren’t causing any symptoms, they can often just be watched closely. If they start causing problems (like pain or bleeding), they may need to be treated. ← CASUAL DAY 7 September – How can you get involved?